I was going to skip having a post today because of my busy weekend, and then I saw Carissa’s post with this tag. The original tag comes from Raindrops On Roses and Whiskers On Kittens. Since I love my books so much (as you will know by the end of this post if you didn’t already), I thought it would be fun to write about them. I have multiple book shelves. 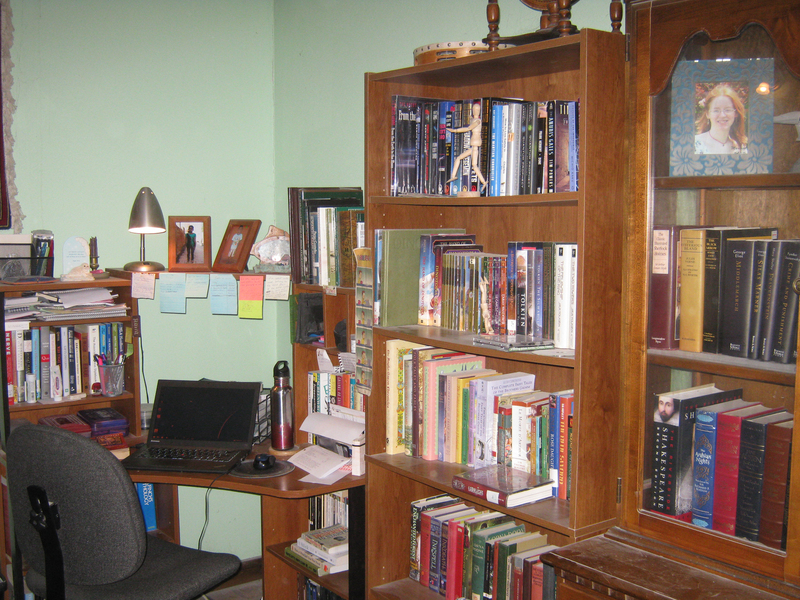 My computer desk has books on the shelves, then there’s a book shelf next to that and books in the china cabinet as well. 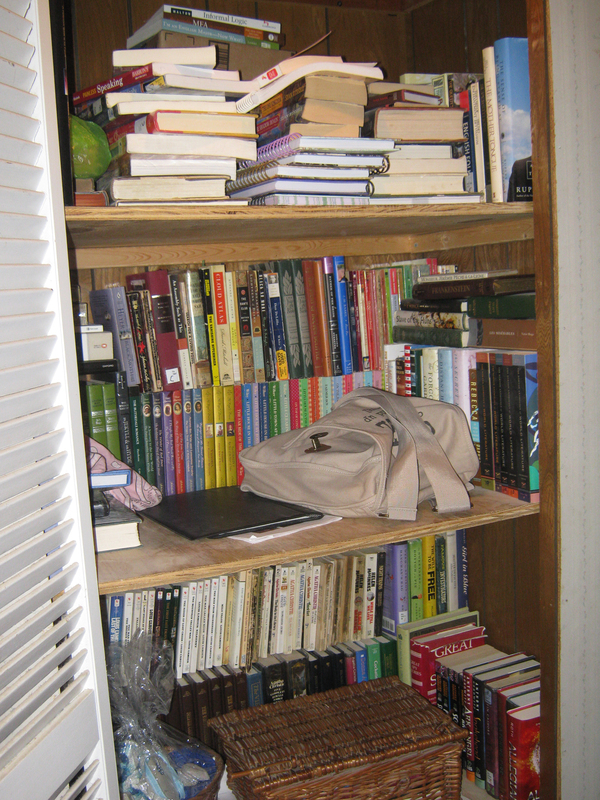 One of the closets in my bedroom is a bookshelf, there’s 16-feet of shelf space above my sister’s bed, I have more books a dresser and cabinet that I think were designed for clothes, and a few crates of books in another closet. In total, I have 1,075 books that are on my master list of books I own (I recently cleaned out the book shelves — it was closer to 1,200 a few months ago). I have them loosely organized by subject. The system doesn’t make much sense to anyone else, but it rarely takes me more than 30 seconds to find any book I’m looking for. 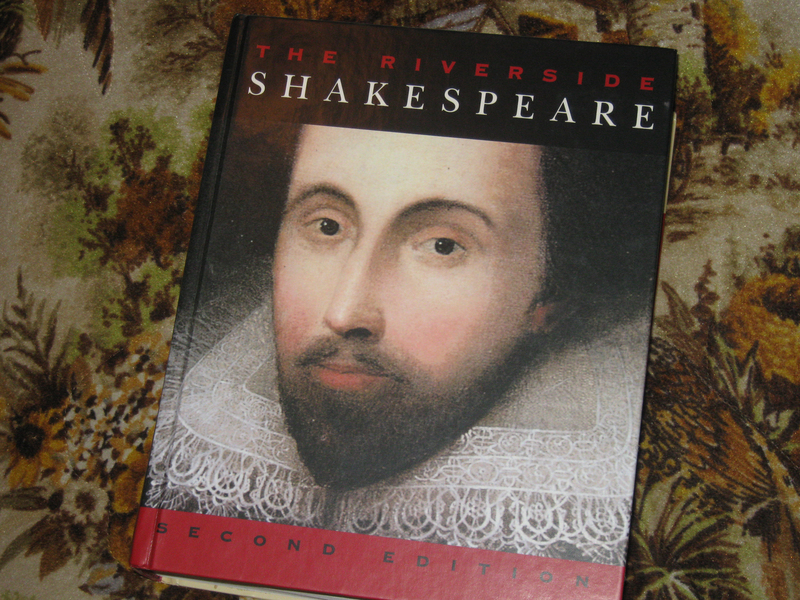 I’m not checking the page count, but I’m guessing The Riverside Shakespeare has all the others beat. I have quite a few thin books, so I’m going to go with the thinnest on the shelves around my computer. It’s The 38 Most Common Fiction Writing Mistakes (and how to avoid them) by Jack M. Bickham. Several, including Ender’s Game by Orson Scott Card and some of Regina Doman’s fairy tale retellings. Robin’s Country by Monica Furlong. For width it’s The Riverside Shakespeare again, but for height is The Anglo-Saxon Chronicles as translated and collated by Anne Savage. They aren’t the most valuable books I own, but my hardcover copies of The Lord of the Rings are probably the ones I spent the most money on. I own and am currently reading Far From the Madding Crowd by Thomas Hardy. I have no idea. Maybe one of the Hardy Boy or Nancy Drew books? Of the ones just out here by my desk it was probably Around the World in 80 Days by Jules Verne. Yes. I have reading copies and display copies for The Lord of the Rings and The Chronicles of Narnia, and I have several versions of some of my favorite classics like Pride and Prejudice. Yes. I probably have more complete series than I do incomplete series. Shadow of the Giant by Orson Scott Card. I’ve been looking for a nice copy, and finally got one through Paperback Swap. I think it’s Allegiant by Veronica Roth. An 1895 edition of Ivanhoe that I picked up at a little shop in Wisconsin. I won an English Book Award my last year at The Ohio State University, and was given Equivocal Beings: Politics, Gender and Sentimentality in the 1790s by Claudia L. Johnson, The Iron Pen: Frances Burney and the Politics of Women’s Writing by Julia Epstein, and The Swerve: How The World Became Modern by Stephen Greenblatt. 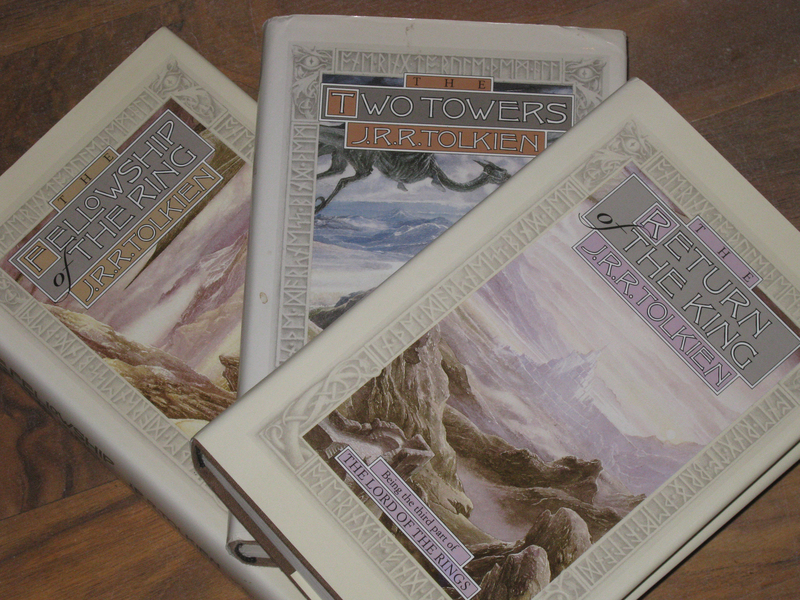 I’m pretty good about loaning books if people ask and I trust them, but I probably wouldn’t give out my nice copies of The Lord of the Rings or books with sentimental value like my mother’s copy of Freckles by Gene Stratton Porter (technically it’s still hers, but I swiped it from her bookshelf). 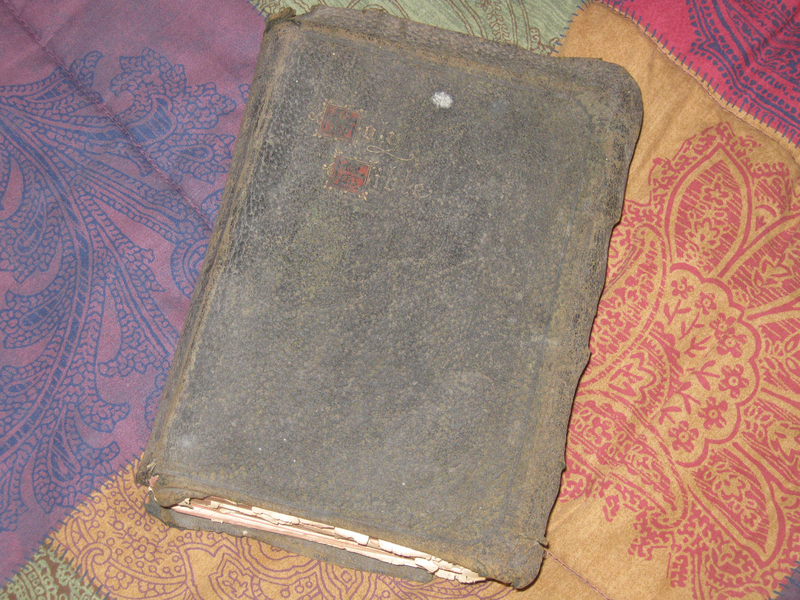 A 1901 King James Bible we found in my grandparent’s house after Grandma died. It’s so fragile I’m scared to open it, but I love it. That’s easy — my gorgeous blue Barns and Noble edition of The Arabian Nights is still in it’s shrink-wrap plastic. So many — I have most of the original Hardy Boys, Nancy Drew, and Tom Swift Jr. books. Several of my Louis L’Amour books are leatherette bound, and my copy of The Hobbit has a lovely green cover with green speckles on the page edges. Maybe my collection of Sherlock Holmes. I’ve read several stories from it, but not all of them. Or perhaps it’s one of my Charles Dickens books like Oliver Twist or David Copperfield. 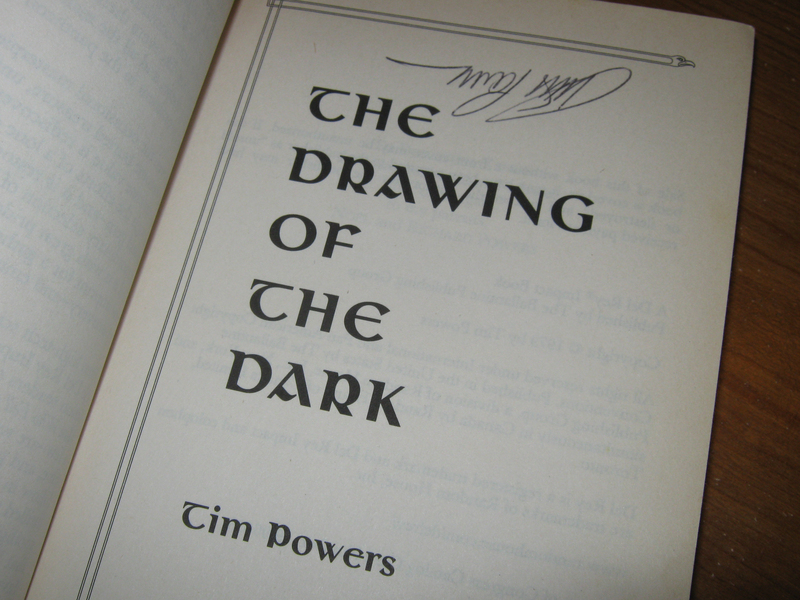 My copy of The Drawing of the Dark by Tim Powers is signed up-side-down on the title page. I got it through Paperback Swap and wonder why someone who went to a book signing got rid of the book.